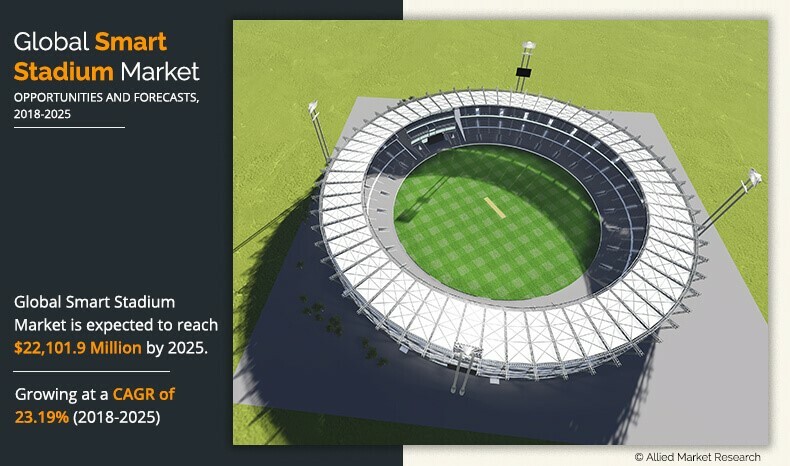 The global market was valued at $4,192.1 million in 2017, and the smart stadium market forecast is projected to reach $ 22,101.9 million by 2025, registering a CAGR of 23.19% from 2018 to 2025. Smart stadiums have number of integrated solutions that help these venues to fulfil and enhance the experience and requirements of fans, players, and medical teams. These stadiums comprise a large number of sensors, surveillance solutions, parking solutions, digital signs, and so forth, which connects to wired and wireless networks. These solutions provide real-time information such as available parking, in-stadium merchandise pricing, and lines at concessions stands, thus enhancing the experience of its fans. Rise in challenge of fan engagement and audience retention has been the major factor in stadium design for both new and existing projects. In addition, government regulations associated with public safety and security in the stadium and focus on energy-efficient buildings also drive the market growth. The software segment led the overall smart stadium market in 2017, and is expected to maintain its dominance in the near future, owing to rise in focus on fan engagement by providing them the best possible experience. Inaddition, rise in need of crowd analytics and event management software also drives the growth of the market. The public safety and security segment dominated the smart stadium market in 2017, due to rise in security concerns in these stadiums, supported by increase in attacks and government regulations for public safety and security. However, the building automation management segment is expected to witness highest growth rate, due to rise in trend of energy efficient buildings, which can be managed through these automated solutions. Europe governed the overall smart stadium market share in 2017, owing to high adoption of smart stadium solutions supported by high technology spending among large number of stadiums across the region. However, Asia-Pacific is expected to witness the highest growth rate during the forecast period, owing to factors such as rise in IT spending in sports infrastructure and growth in number of sports league in the developing countries. The report focuses on the growth prospects, restraints, and trends of global smart stadium market analysis. Moreover, the study provides Porters five forces analysis of the industry to understand the impact of various factors such as bargaining power of suppliers, competitive intensity of competitors, threat of new entrants, threat of substitutes, and bargaining power of buyers on the growth of the market. The global smart stadium market is segmented based on component, application, deployment model, and region. Based on component, it is categorized into software and service. 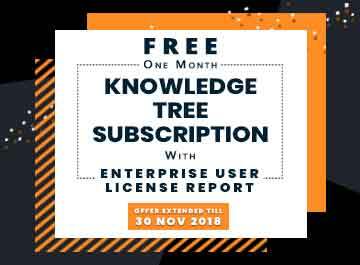 Based on application, it is segregated into digital content management, stadium & public security, building automation, event management, crowd management, and network management. Based on deployment type, it is bifurcated into on-premise and cloud based. Region wise, the smart stadium market analysis is done across North America, Europe, Asia-Pacific, and LAMEA. 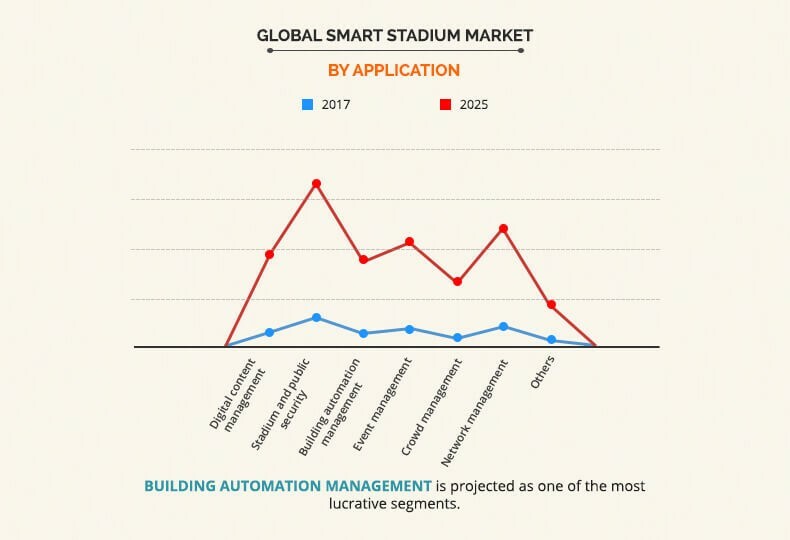 The key players operating in the global smart stadium market include Cisco Systems, Inc., Huawei Technologies Co., Ltd., IBM Corporation, Intel Corporation, NEC Corporation, Johnson Controls International plc, GP Smart Stadium, Ericsson, NXP Semiconductors N.V. and Schneider Electric SE. The global smart stadium market is influenced by numerous factors such as growth in focus on fans engagement, rise in adoption of IoT for stadium infrastructure, and government initiatives for energy efficient buildings and public safety & security. Moreover, rise in sports league culture in developing countries such as India is expected to impact the market growth during the forecast period. However, each factor has its definite impact on the smart stadium market growth. Digital signage is a major part of digitally connected experience. The high-tech consumer devices offer technologically sophisticated services, which has enriched at-home experience for the sports fans. Stadium operators are facing at-home experience as their major challenge. To overcome this challenge, stadium operators are focusing to provide delighting fan experiences at stadiums. These include shorter queue while entering & leaving stadiums, better directions, and fast internet connections. Smart stadiums are providing open Wi-Fi and stadium apps to fans to facilitate aforementioned fan experiences. This contributes to both increased revenues and better fan experiences, which is expected to drive the smart stadium market during the forecast period. A huge number of people are packed into stadium and hence stadium operators have to be prepared for every situation. Alertness of security personnel in stadium is required to avoid any unfortunate incidents. Stadium operators are required to be ready with their proper evacuation of people from stadium in case of any such incidents. Moreover, the sport governing bodies are tightening the security norms in the construction of the stadium. In recent pasts, there have been many terrorist attacks and fire broke out incidents in some famous stadiums. For instance, Paris terror attack in 2015 claimed lives and injured many. Other than such incidents, there are few instances like children separated from their parents can easily be avoided. Smart stadiums include feature such as detecting entry of any suspecting items, can easily locate unruly fans and display the picture of missing child on big screen. Smart stadium also support green initiative by allowing only disposable items and navigating fans to dispose waste in dustbins present in the stadium. Smart stadiums being fitted with numerous sensors and cameras, it can feed real-time data to security persons in charge and help in monitoring the crowd and also communicate the external police in case of any problematic situations. These regulations are expected to drive the smart stadium market during the forecast period. Smart stadium is a technological marvel with various hardware such as WI-FI access points, gateways, and sensors. The technology infrastructure layer of smart stadiums includes networking equipment, physical hardware, and operational software, which require significant investment by stadium owner to install and maintain the aforementioned hardware and software. In addition, the smart stadiums are required to be built in accordance with the stringent security regulations for public imposed by the sport governing bodies, which increases the overall stadium construction cost. Moreover, the stadium owners have to wait for longer time period for return on investment (ROI). Thus, the stadium owners are reluctant to invest significantly at initial stage of stadium construction, which is expected to hinder the growth of the smart stadium market. The solution for the restraint is the stadium owners or stadium management can organize or allow events other than sports such as music concerts, award events, and fests to increase the revenue of stadium. With increase in franchise-based leagues all over the globe, the sport governing bodies are encouraging corporates and eminent personalities to invest in franchise-based leagues to promote the sports worldwide. The sports fans are eager to experience these leagues in stadiums owing to the glamor of these leagues. The stadium ticket price range of such leagues is high. Hence, there is an increase in the expectations of the fans for better experiences such as on-seat food delivery, live interaction among stadium fans, and hassle-less parking. Smart stadium is the solution to the aforementioned queries of the sports fans and thus, the growing sports league culture is smart stadium market opportunity. This study includes smart stadium market trends along with future estimations to determine the imminent investment pockets. The current smart stadium market size is quantitatively analyzed from 2017 to 2025 to highlight the financial competency of the industry. Porters five forces analysis illustrates the potency of buyers & suppliers in the global smart stadium industry. 8.4. Huawei Technologies Co., Ltd.
Smart stadium solutions have been one of the significant developments in sports infrastructure industry during the last decades. These solutions provide fans a convenient and personalized experience by providing information on parking availability, shorter lines and directions through crowded stadiums, seat upgrades, special offers, and others. In addition, this technology has also reduced the pressure on stadium operators and helped them achieve improved business outcomes. According to Intel, smart stadiums relieve the pressures on stadium operators in number of ways and helps them in achieving higher profit simultaneously. The adoption of these solutions has increased over a period of time, owing to increase in focus on fan engagement, rise in adoption of IoT technologies in stadium infrastructure, and government initiatives regarding energy efficient buildings as well as public safety & security. The smart stadium market is consolidated with the presence of key vendors constituting large market share. Europe and North America are the prime consumers of these systems. However, Asia-Pacific is expected to experience robust growth in the near future, owing to rise in sports infrastructure spending and growing sports league culture in the developing countries such as India. Some of the key players profiled in the report include Cisco Systems, Inc., Huawei Technologies Co., Ltd., IBM Corporation, Intel Corporation, NEC Corporation, Johnson Controls International plc, GP Smart Stadium, Ericsson, NXP Semiconductors N.V., and Schneider Electric SE. These players have adopted various strategies to increase their market penetration and strengthen their position in the industry. For instance, Microsoft Sports and Global Sports Innovation Center and Spanish soccer club Real Sociedad announced a partnership to improve the facilities of the club’s Anoeta stadium. The agreement is focused on technological innovations to turn the arena into a smart stadium.